Well now, this is interesting... If you've read this blog in the past, you know how much I like the Renault R5 / LeCar. I even owned one a long time ago. The Renault R5 was sold in the U.S. from 1976 through 1983. Shortly after its introduction here Renault branded it "LeCar." 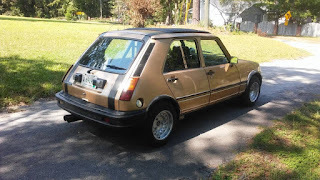 By U.S. Renault standards, it sold well. The LeCar was cheap, economical, fun to drive and comfortable. It was not quick. Meant to be a commuter car, the engine put out between 51 and 55 horsepower. In Europe, the R5 was an all purpose car. The range went from incredibly tame (especially when fitted with Renaults 0.8 and 1.1 liter engines) to incredibly insane (the mid-engined R5 Turbo). This LeCar has been mildly modified. 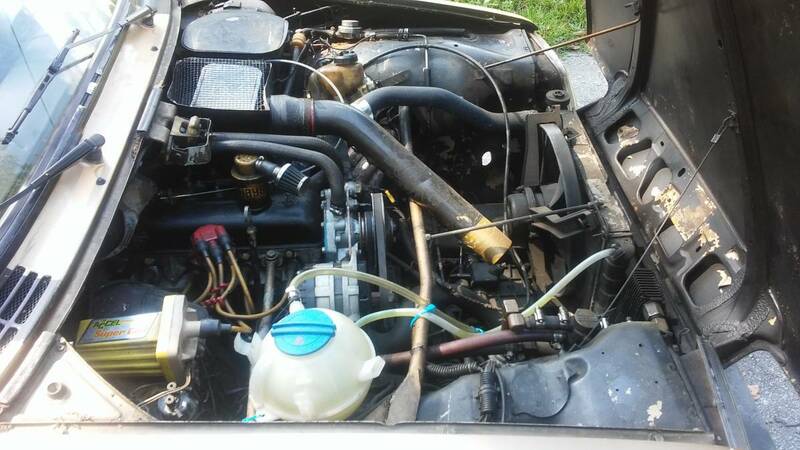 The seller states "The engine is a 1.6 with a 1.8 head on it and was recently rebuilt by the previous owner. It is also has a performance cam with a 2 step installed into the accel ignition system." I'm sure this car is not a rocket, but more horsepower in a LeCar is never a bad thing. The rest of the car has been modified, too. 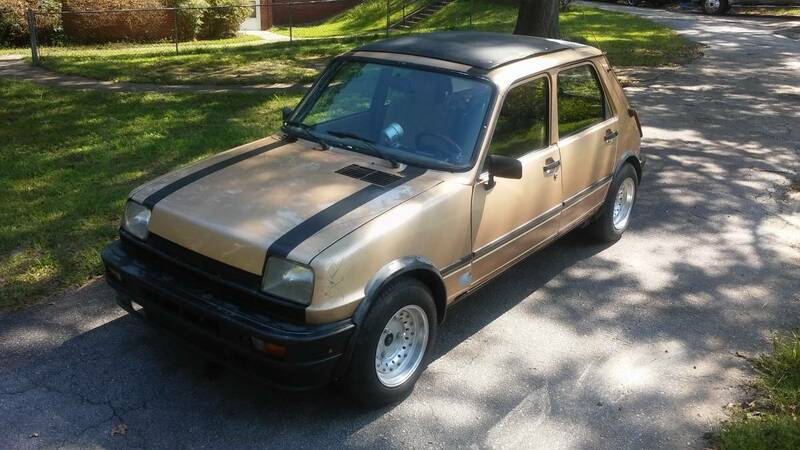 This relatively rare 4 door LeCar has a roll bar. There are some wide aftermarket wheels and some small, tasteful fender flares to go with them. There is a twin exhaust sticking out of the back. On the inside you see a big Momo-type steering wheel. It looks a little awkward, I would have gone with the "sport wheel" Renault offered as an option. (It came standard on the Black Beauty and Sport editions.) There are at least 5 aftermarket gauges. One is a tach, which is needed as the LeCar didn't have one in most U.S. editions. But what are the other gauges? I can't tell from the pictures. 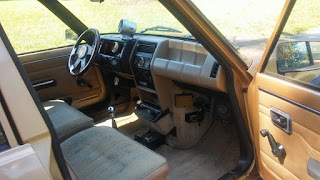 There are several other "things" (for lack of a better word) attached to and around the dashboard. It's all impressive looking. If you're looking for a cool - not often seen - car that is fun to drive, this LeCar may be worth looking at. 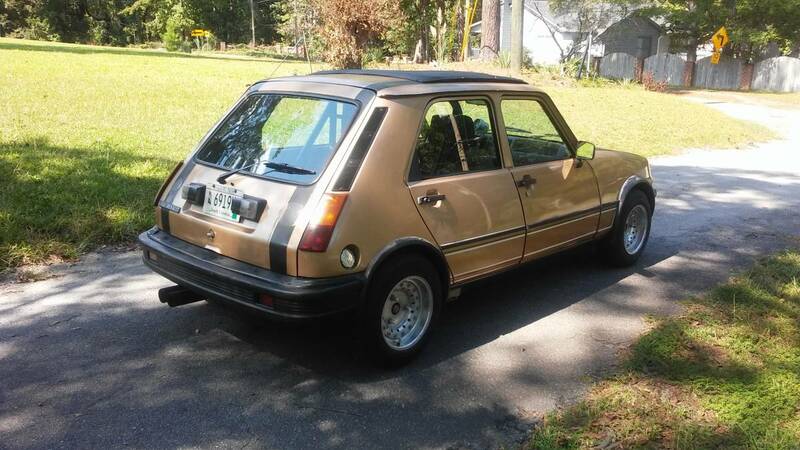 Located in West Columbia, SC, click here to see the Craigslist ad. WOW! I'm so excited to see you're back. I was always a loyal, constant reader of your blog and just for the heck of it, I typed in justacargeek to see if you ever got back on the horse. Thanks for being here! And big thanks for finding a LeCar. I, too always liked them and maybe one day I'll find the one for me. SO cool on all levels.